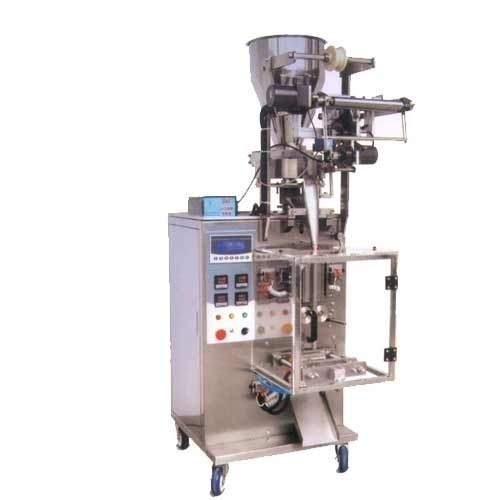 This is an automatic Measuring-Cup Packing Machine which comprises a cup metering device as well as a VFS 5000DS vertical filling-packaging machine. This Measuring-Cup Packing Machine is especially appropriate for the metering packaging of very minute particle products. Measuring-Cup Packing Machine combines the purposes of metering, bag-making, sealing as well as printing and counting. The operating interface uses the advanced touchscreen. It also has an automatic bias detection and correction system. The parts that come in contact with salt are designed of 316L stainless steel. Other parts of the machine are produced of 304 stainless steel.